Holding central committe meeting in Darjeeling, Today GJMM Binay Tamang faction has expelled Gorkha Janmukti Morcha top leaders including its founder president Bimal Gurung, General secretary Roshan Giri, Nari Morcha president Asha Gurung and few other central committe leaders from the party for six months. Following a central committee meeting, held at Sterling Resorts in Ghoom, Binay Tamang was appointed as the Party President, and Anit Thapa as the General Secretary. Other suspended leaders are Swaraj Thapa, Prakash Gurung, Priyabardhan Rai, Barudh Thapa, Bhaskar Rai, Anmol Thapa and Sanjib Subedi. 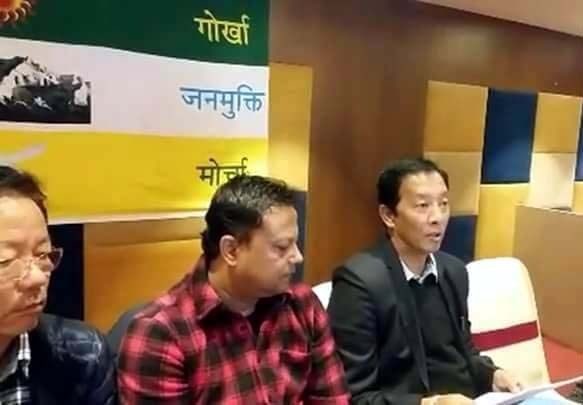 Holding central committe meeting in Darjeeling, Today GJMM Binay Tamang faction has expelled Gorkha Janmukti Morcha top leaders including its founder president Bimal Gurung, General secretary Roshan Giri, Nari Morcha president Asha Gurung and few other central committe leaders from the party for six months.